I’m a nutritionist, it’s true, but I am also absolutely ALL about balance! And I certainly enjoy an alcoholic beverage once in a while, with my drinks of choice being Campari & Soda or Baileys on Ice as a night-cap. However, Baileys can be a problem for those who have issues with dairy (be it an intolerance or choice not to eat it). 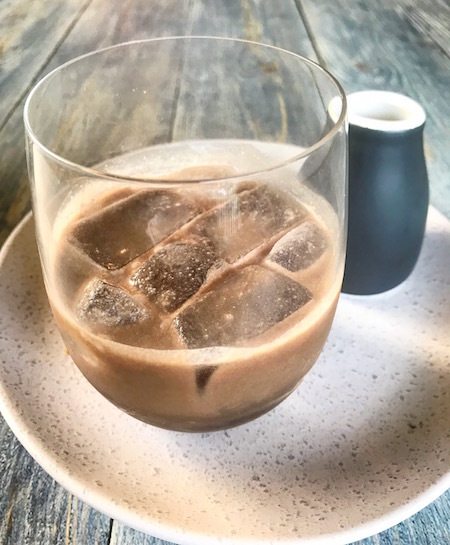 This was me for a long time so I decided to make a dairy-free version of Baileys! And you know what, while it doesn’t taste exactly like Baileys, it tastes pretty darn good! Just remember, as with all alcoholic beverages, consume responsibility. Place all ingredients in a blender and blend for about 15 seconds. Taste and adjust as you like. I love Dairy-Free Baileys it drizzled over coconut ice cream! Store in the fridge, it should last several weeks, just give it a good shake each time before pouring as the the cacao may settle.